These are well made and elegant, perfect for dress up or dress down! They have a beautiful satin finish and brushed design and weigh 3. grams. These are available in my store. Do you love cameos? This is a fantastic lot of cameos, 25 brooches, necklaces, pendants & bracelets. Materials are mother of pearl, carved shell, black onyx, celluloid, porcelain and glass. Metals are 12K gold filled, sterling silver, silver tone and gold tone. Marks are 925, 12K GF, Avon, 1928 swirls, Jezlaine, W. Germany, White Co. Click the link below to find this collection in my store. Do you like vintage pictures that have been colorized? If they are done well, I do. This is one of my favorites. There are so many things that I love about it, the outfit, jewelry, the fact that she is such an intriguing woman. 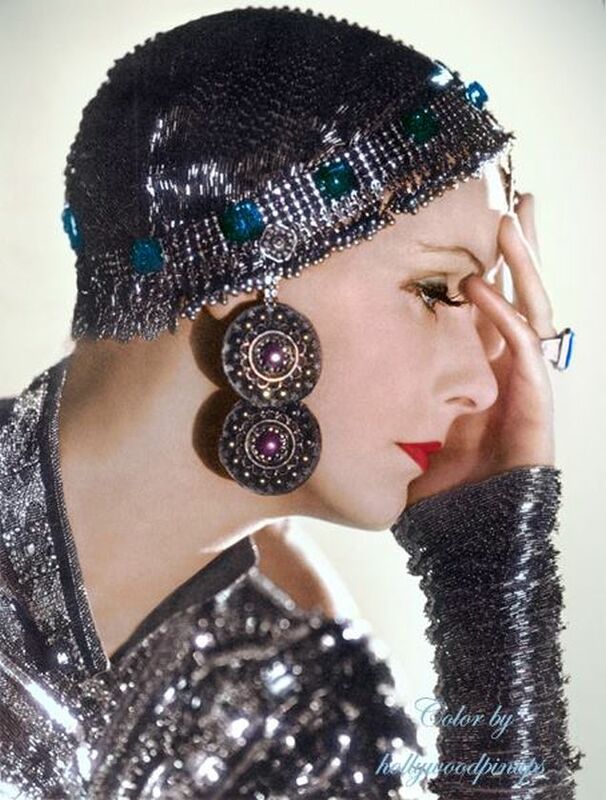 To find more fabulous vintage celebrity photos, dresses and jewelry, just click below and follow me on facebook. I just acquired several vintage and antique hand carved shell cameos. You can find them by clicking below. If you like substantial bracelets, this one would be perfect. It 14K yellow gold, is 7" long, almost 1" wide, and weighs 33.3 grams. For more information, just click the link below the picture. 14K yellow gold bracelet can be found here. This is a 14K yellow gold slide with channel set rubies, diamonds, emeralds and sapphires. It opens in the back so it can fit over pearls, beads or your favorite gold chain. These earrings are fabulous. They are vintage, sterling silver, with pearls, a leaf design and screwback closures. and leaf design. Definitely head turners.